Feisty, commanding, and seriously contagious, the Lines EP from UK band Epic Problem provides another excuse to claim that the finest punk rock comes from this side of the pond. Ok that is a big debate which can never truly be resolved but the quartet from New Mills, Derbyshire with their latest slab of ferocious and raw anthemic rock ‘n’ roll only add to the evidence. The fact that their sound is seeded in the melodically spawned ‘Gainesville’ punk sound does not deter that declaration either, as Epic Problem simply twist it with further inciting genre additives into something not necessarily unique but openly distinct to themselves. Consisting of four tracks the EP is an adrenaline fuelled stomp which captivates, ignites, and bruises the passions, though not always in that order. The band formed in 2010 when guitarist Neil ‘Mackie’ Mclennan (from eighties punks Blitz) linked up with vocalist/guitarist Jake McCullough (Dangerfields, Dead Subverts) to sing on songs the former had written. Soon after bassist Tony Morrisson and drummer Greg Boulton joined up and the band worked on writing more songs and preparing their outbreak into the country. Their live debut came supporting The Business in the December of 2011, with the following year starting off a constant flow of shows to now which has seen Epic Problem sharing stages with bands such as Argy Bargy, Subhumans, Dead To Me, Nothington, and The Blacklist Royals. Recordings wise, The Lines EP is the successor to the six track mini album All Broken, a well-received and acclaimed release which the new record is sure to emulate. The title track kicks things off, riffs and rhythms a caustic force from the start matched by the great abrasive gravelly vocals. It is not long before a delicious tempting of anthemic melodic enterprise and group calls with Mackie and Boulton supplying a rich grazing support to McCullough, breaks out. Thoughts of Leatherface and Dillinger Four make a suggestion though equally the band triggers comparisons to Social Distortion and in some ways fellow Brits, The Vox Dolomites. Truthfully though song and sound whilst offering familiarities forge a presence which is distinct to the band; guitars and vocals a compelling inventive provocation driven by the voracious energy and antagonistic passion of the rhythms. The following Deny snarls and rips out an urgent pace from its opening second which is as predatory as its predecessor but with a slightly more belligerent gait, or certainly with a different twang to its voice and intensity. The track also lacks the incisive hook of the first song but has no lack of infectiousness to its vocal squall and rhythmic punctuation to its expressive riffs and lyrical croon, a bait elevated by the outstanding Sink, a rowdy anthemic charge of a song taking the best essences of the previous tracks and turning them into another potently addictive brawl of punk rock. The best track on the release, though seriously challenged with each play by the opener, the song alone with its rhythmic taunting and sonic mischief around a virulently catchy hook loaded with a wealth of melodic barbs and an old school fire enhancing its triumph, reinforces the stature of band and genre. The release is completed by Weak, a cover of The Beltones track. It is an accomplished and passionate offering revealing more of the band’s craft and adventure but as good as it openly is just does not match up to the other tracks. Nevertheless it makes a fine and pleasing end to an excellent release. It might be greedy to want a full-length assault from Epic Problem so soon after the release of the EP but that is the kind of hunger it inspires. Along with many other bands, this explosive treat shows that British punk continues to lead the way for our maybe slightly based thoughts. The Lines EP is released digitally and via Longshot Music and Rebel Sound Music in the USA, and Rebellion Records in Europe with 100 on Black vinyl, 150 on White vinyl (exclusive to Rebel Sound), 150 on Blue vinyl (exclusive to Rebellion) and 200 on Splatter vinyl (exclusive to Longshot) available. After getting over the disappointment that Miss Vincent was not a psychobilly band, their debut EP’s cover and title as well as the band name all the clues adding up to that deceitful assumption, the UK pop goth punk band turned out to be a rather enjoyable proposition which in Creepy they have a release which is more than a decent ride of melodic persuasion and feisty energy. Emerging as a hybrid of Alkaline Trio and Fall Out Boy with some healthy genes of NOFX, AFI, and Social Distortion spliced in for extra flavour, the Guildford quartet have introduced themselves with a release which without lighting fires leaves a wash of satisfaction and promise behind which cannot be ignored. Formed in 2012, the foursome of vocalist/guitarist Alex Marshall, guitarist Lawrie Pattison, bassist Owain Mainwaring, and drummer Jack Donnelly has earned themselves a solid reputation and potent fan base around the southeast of the country. The Creepy EP has all the charm and infectious persuasion to send the band into passions much further afield. It will not be lighting new pyres of adventure for pop punk certainly but should place Miss Vincent in the watch closely column of the media and future fans alike. The release opens with Deadlock, a firm and well-crafted invitation but one which leaves the passions a little underwhelmed. From the strong vocals to incisive web of riffs and sonic invention, the song makes an appealing companion with hints of unique imagination whispering from within, but ultimately it lacks the spark to ignite anything more than a passing interest and respect for its predictable but accomplished offering. The following I Don’t Want This has no such problem, the temptation from its opening charge of jagged riffs and contagious groove is an instant awakening for ear and thoughts. True there is little new to devour but the song has the fuse and fuel to grip full attention and breed an equally keen appetite. With a strong whisper of Green Day and slighter spice of Against Me! to its stomp, the encounter is a vibrant and energetic persuasion, the bass of Mainwaring a prowling throaty shadow which seduces whilst the great harmonies of the bassist and Pattison make a great backdrop to the delivery of Marshall. Planning To Fail, with the rhythms of Donnelly crafting out a sinew framed cage for the song to wrap around, lies somewhere between the opening pair, at times leaving a lack of fulfilment on the taste buds and in other moments showing an invention and imagination which adds a hearty confidence to their promise and future creativity. It has more than enough to light a deeper intrigue over their horizons though as does its successor Carry On, a track which surges from the start with a magnetic fire of riffs merging into virulently infectious melodies and hooks. It is an excellent romp which takes best track honours on Creepy and leaves the emotions keener and greedier than before. The closing Testing Times is bred from the same seed box as its predecessor, the opening riot of rapacious melodic flames and taunting riffs veined by crisp rhythms is irresistible as it leads the ears into the again impressive vocals of Marshall. There is a sense of Billy Talent to the construction of the song, hooks and sonic barbs littering its passage to ensure no one escapes the song’s addictive claws and adventurous enterprise, which actually leaves the previous tracks seem lacking. It is a great conclusion to a release which sets down an opening marker for Miss Vincent that should see them as they evolve take to loftier plateaus and recognition. 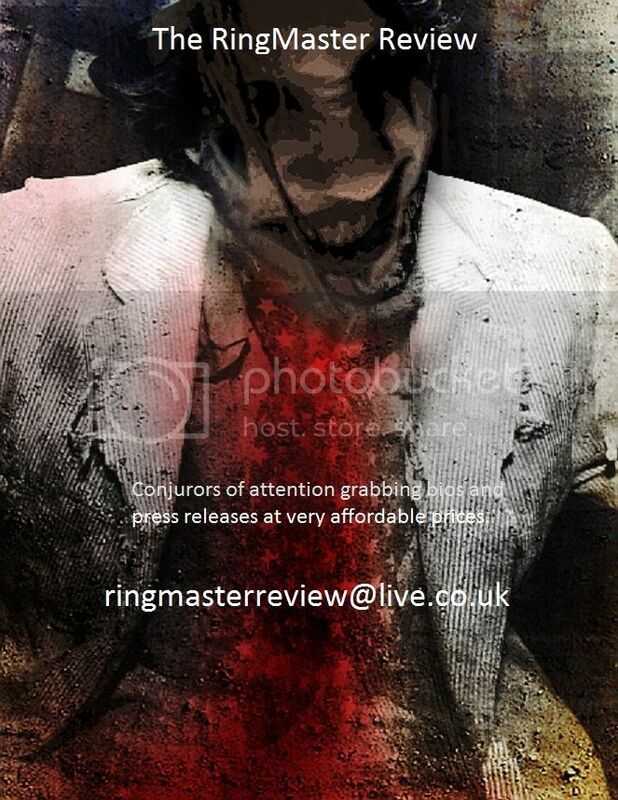 It may not provide anything to get your teeth of originality into but as the ground floor of something with all the possibilities of major things rising from within, Creepy is well worth a slice of your time and enjoyment. What do you get if you merge psychobilly, hard rock, and hungry metal into one bruising riot? Whatever it is called Danish band Grumpynators is probably the best at it, certainly on the evidence of their latest EP 666 Rpm. Rife with rousing and aggressive rock ‘n’ roll or what they call Danish Motorbilly, the five track release is a thrilling muscular storm which unleashes all the primal pleasures inside with hungry energy and rapacious devilment. Formed in Copenhagen in the January of 2011 by ex-members and crew of Taggy Tones and Volbeat, Grumpynators made their live debut at the Danish underground festival Barnyard Rumble in the August of the same year going on to build a big reputation for their performances which has also seen them tour with Magtens Korridorer in 2012 and Volbeat earlier this year. Musically the quartet of vocalist/guitarist Emil Øelund, guitarist Christian Nørgaard, double bassist Jakob Øelund, and drummer Per Fisker create a presence and confrontation which is like being accosted by the joint animosity of Motorhead and Nekromantix wrapped in the shadowed intent of Johnny Cash, Resurex, Social Distortion, and Volbeat. Equally the band has a distinct flavour which sets them apart from the rest, first shown with their first demo EP late 2011 and evolved into real brute force with 666 Rpm. The new EP is an instigator for limbs and instinctive passions to raise a storm and enjoy rock ‘n ‘roll at its riveting best. As soon as the rampaging hypnotic beats of Fisker open up first track No Monsters In My Bed, an instantaneous connection seeded in a personal love of psychobilly erupts, the spine of the impending song spawned from the same passion. The choppy riffs and potent bass slaps confirm the stance and poised around the Lemmy like growls of Oelund makes for a formidable and infectious lure to which defences crumble immediately. Stomping across the senses like a gang of lustful rockabillies on a Saturday night cruise, the track punches and prods the ear potently with rhythmic provocation and guitar lashes which coursing with sonic flames which leaves the passions alight. Virulent in its addictiveness and merciless in its ability to have limbs and voice joining in its charge, the song is incendiary glory which steals top honours on the release straight away though it is seriously challenged as the other songs state their declarations. The following Paranormal Heads equally has sinews and aggressive breath unleashed from its opening seconds before sculpting an epidemic of infectiousness which is impossible to resist. Its presence has a more heavy metal/rock intention and body which merges essences of The Meteors into the more dominant demands of again Motorhead and the likes of Anthrax and The Wildhearts. Once again it is a track which recruits the listener into its dirty honest sounds with ease and leaves lungs and senses gasping for breath once it takes its leave. 1985 has a swagger and blues lilt to its slower crawling gait aligned to a southern psychobilly call which swings and lures the senses and body into a teasing hard rock waltz. As it progresses the song expands and opens up sonic flumes of enterprise and melodic rock flames which sizzle on the flesh before that confident croon of the track returns to command further physical union from its recipients. The release is completed by the stalking Miss You and then Grumpynator. The first song again brings essences of cowpunk and rockabilly into a feisty metallic boil of sound and invention which erupts to singe the senses and feed the now fully evolved hunger for the release. With a Volbeat meets Mad Sin and Tiger Army with strong whispers of Metallica and Flogging Molly to its seduction, the song brings ardour into another pinnacle of lustful submission whilst the final song is unrelenting heavy metal/hard rock you can only compare to Motorhead in sound and quality. It all makes for an exciting and impossibly satisfying release which marks Grumpynators as a band set to ignite and push rock music on with striking power and efficiency in the near future. Volbeat now has a real rival as Denmark’s best metal/rock band, though to be honest every rock ‘n’ roll band in the world had better watch out as Grumpynators is coming to challenge their status and they do not accept no as a response.